The Bergpolderflat constitutes the prototype for many later slab-shaped housing blocks. 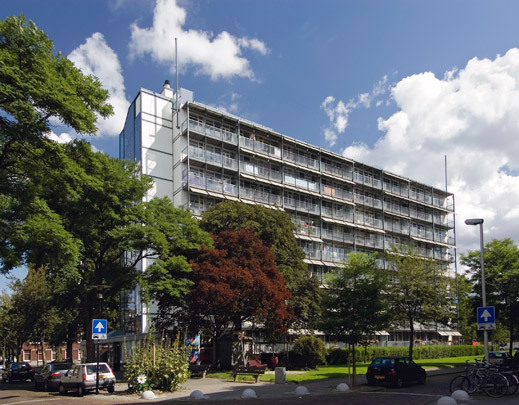 Despite the fact that the City of Amsterdam had condemned the housing of workers in high-rise blocks as economically irresponsible, and the residential tower block 'for the better-off' on Victorieplein had proved a financial disaster, several Rotterdam contractors plucked up courage and tackled the problem of high-rise workers' housing themselves. Unlike the formal principles underlying the Amsterdam block (a vertical thrust for Berlage's Amsterdam-Zuid masterplan), reasons to build high in Rotterdam were by nature economic, social and practical. They were based on the advantages to health of sun and air, the possibilities of ample greenspace in-between blocks and the economic advantages of a thorough-going standardization and prefabrication, leading to competitive rents. The building consists of nine levels of housing each containing eight identical gallery-access flats. Access galleries are reached using a lift located behind the glazed stair tower at the building's head and stopping at intermediary levels each serving two galleries. The dwelling units, six metres wide by eight metres deep, are subdivided into a narrow and a wide zone. The latter contains the entrance, kitchen, toilet and washroom on the access gallery side with the living room on the balcony side. The narrow zone comprises a children's bedroom on the gallery side and the master bedroom adjoining the balcony. An all-glass partition equipped with sliding doors separates the living room and the master bedroom. The building's structure consists of a steel frame with X-shaped wind braces between the lightweight sandstone partition walls. Floors alternate upwards between two of wood and one of concrete as a fire precaution. Stairs, access galleries and balcony floors are of prefabricated concrete. The timber fronts with movable steel components are prefabricated too. On the ground floor are storage spaces and washing and drying facilities which are still used today. Space was also reserved here for a children's nursery. A low-lying volume set square to the slab relates this ostensibly alien high-rise element to the street pattern of its surroundings, marks the entrance and screens the communal gardens from the street. These extra amenities are the main reason why living in this high rise has a quality almost entirely lacking in its successors of later years. The small dwelling units have been adapted to satisfy current standards.